Chandrababu stared at the initiation. This is the first time an AP Chief Minister is going to the initiation. Chandrababu ruled out of the birthday celebrations for a 12-hour fast. He declares war on the center. Chandrababu has chosen this fasting fast to inform injustice on the national level. Chandrababu, who reached the stage for exactly 7 o' clock, sat in the aftermath of all the religious prayers. Prior to the launch, He paid floral tributes to the great persons. Chandrababu wrote an open letter to the people during his inauguration. In this letter, Babu explained that he had to undergo the circumstances. He said that he has chosen this initiation to ignore the neglect of the Center AP. Chandrababu has called for intensification of the fight for the implementation of special status and division guarantees. Chandrababu felt that the central government was unfair in the last budget of the party. The Center has not been able to complete any of the issues included in the division of the law, but the newly formed state has not been allocated funds for the construction of the capital. Chandrababu has blamed the central government for misinterpreting that they have not given any utilization certificate to the Center. Chandrababu believes that the conspiracy to divide the people of the state is hidden. The Central Government is trying to divide the people in the AP. Chandrababu made clear that his struggle against the central government did not recognize the legitimate and legitimate demands of their own. He said that the funds were not allocated for development of the backward districts. 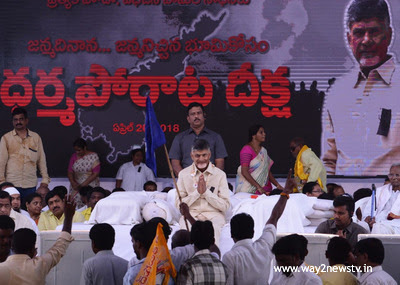 Chandrababu started a 7 O'clock fast at the Indira Gandhi Municipal Stadium, Vijayawada. The nightmare continues for 7 O'clock. He said that his fight will not stop until the center gets down. Traffic restrictions were imposed on Vijayawada by the police during Chandrababu. Vehicles from Visakhapatnam have been diverted to Hyderabad. From Hanuman Junction to Nuzvidu, Mylavaram, and Ibrahimpatnam, vehicles are to go to Hyderabad. Parking facility was set up for the workers from 13 districts of the state. Approximately about one lakh people will attend this initiative.